Tetracycline stains are grey stains that appear as a side affect of taking the antibiotic Tetracycline as a child. This very affective antibiotic can leave behind these unsightly stains that have gone largely untreated, as the stains occur beneath the enamel of the tooth and so cannot be removed by traditional means. In fact, the only way to get rid of them is to shave part of each tooth away and adhere a customized veneer or crown to them. Many dental professionals would not do this, not wanting to compromise the strength of the tooth by removing tooth structure unnecessarily, and so their patients were told to live with these stains for their entire lives. Dr Maddahi, Anti-Aging Dentistry’s premiere specialist, led the battle in developing the right kind of porcelain veneers and crowns, in conjunction with a unique kind of glue that was also more pure in color than previous glues that tended to change over time. The combination of these two customized components allows dentists to treat patients suffering from Tetracycline stains without removing nearly as much tooth structure as was necessary to mask the stains before. The results are stunning. This new approach to treating Tetracycline stains is providing a solution for thousands of patients who didn’t have one before, and their transformation can be complete in just 1 to 2 weeks, giving them the freedom to smile they may have been missing since a very early age. 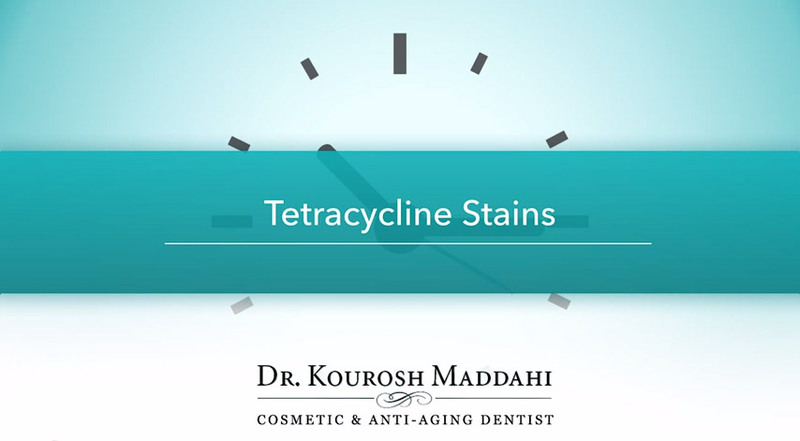 Call or email to schedule an appointment with Dr. Kourosh Maddahi in Beverly Hills to find out how he can help you with your Tetracycline stains treatment.